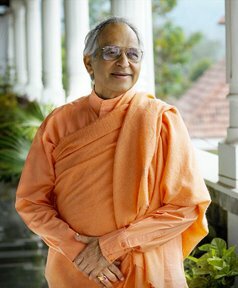 Swami Veda Bharati is the founder and Spiritual Guide of both the world-wide organization, Association of Himalayan Yoga Meditation Societies International (AHYMSIN) and the Swami Rama Sadhaka Grama in Rishikesh, India. He is also the Spiritual Guide of Sadhana Mandir Ashram, his master's ashram in Rishikesh and of the Himalayan Institute Hospital Trust near Dehradun, India. He was born into a Sanskrit speaking family and raised in the centuries old Sanskrit tradition. From the age of nine he has captivated audiences with the depth of his knowledge and intuition in the Vedas and Patanjali's Yoga Sutras. All of his knowledge has come intuitively through which he has attained the highest academic degrees; BA (Honours) (London), MA (London), D. Lit. (Holland), and is the author of many books. He was initiated into one of the highest paths of meditation and yoga by his master, the celebrated yogi Swami Rama of the Himalayas. His immense experience and scholarship enable him to lecture on a wide variety of topics. 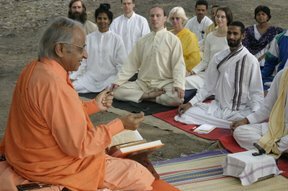 He is able to conduct meditation in seventeen languages. His ability to guide his audiences to calm states and meditative stillness is well known to his students in the various centers he has established all over the world. 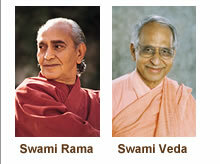 Swami Veda Bharati combines the best of the ancient and the modern. He is an inspired and loving teacher, a prolific author, poet and an international lecturer. With his unique personality he radiates peace, divine love and joy wherever he is. He was honoured by the Swamis of India who conferred on him the title of Mahamandaleswara, placing him among the top 30 or so Swamis of India. The only title above Mahamandaleshwara is that of Shankaracharya, a title that was bestowed on his master the Honorable Shri Swami Rama of the Himalayas.